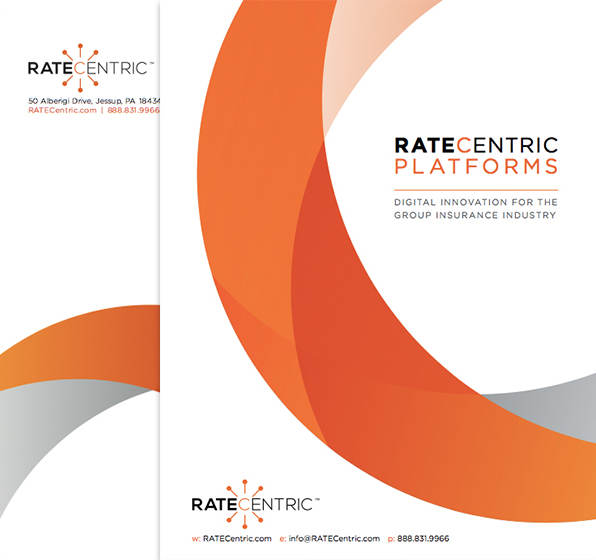 RATECentric, a new and innovative digital platform serving the small group insurance industry, is a sea change for the way that insurance carriers and producers navigate the sales process. With 30 years of experience in the insurance industry, the team behind the RATECentric platform have a deep understanding of the shortcomings that the traditional sales process poses and the potential impact of a fully digital platform. When the RATECentric team decided it needed to attract the attention of executives at the top insurance carriers, it came to BlackOut Design for a brochure and envelopes brandishing a bold design and the company’s distinctive orange color palette. The brochure opens with the immediate benefits that carriers could realize with RATECentric’s fully digital platform—from reduced processing costs and lead time to increased efficiency in quoting, case submissions and billing. The printed collateral aligns perfectly with the impressive website design that BlackOut developed earlier this year to bring awareness to the brand and its cutting-edge capabilities.